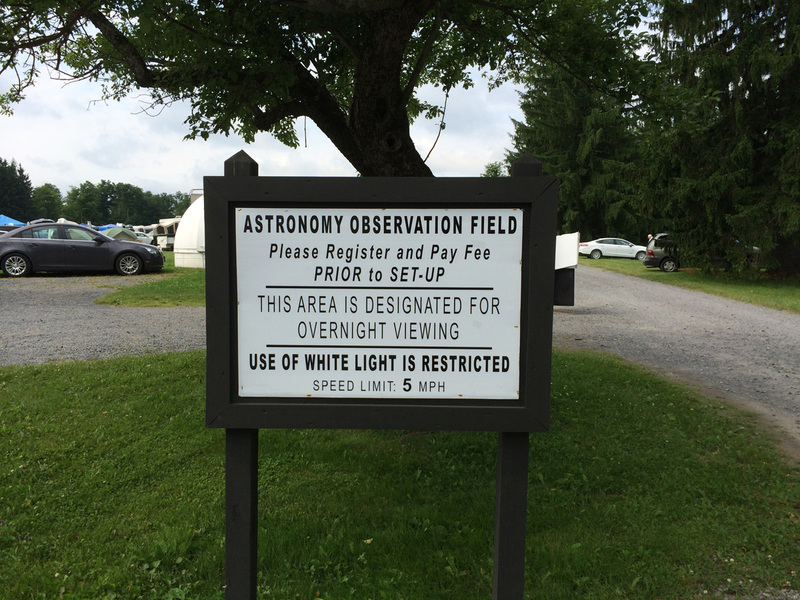 This past June 26 – 29, the Astronomical Society of Harrisburg PA hosted their annual Cherry Springs Star Party (CSSP) at, appropriately, Cherry Springs State Park – the second location to be designated an International Dark Sky Park (wikipedia entry). The park’s about 3.5 hours from Syracuse and, by most metrics, in the middle of nowhere (if you find petrol as you approach the park, get it). Some light and relevant U-Haul reading on the way to CSSP. There’s quite literally no basic cellular service anywhere after the 3 hour mark (certainly the case for AT&T customers), leaving the park wifi and, of course, AstroGizmos to provide all the connectivity one should otherwise be trying to get away from for a weekend of observing (but definitely couldn’t get away from, so both wifi’s were much appreciated!). And for those wondering “does anyone make those?” – AstroGizmos had available 12 V hair dryers (with varied powering options) for those looking to evaporate eyepiece condensate on dewy nights (I now have mine). Cherry Springs State Park – first sign in the park. 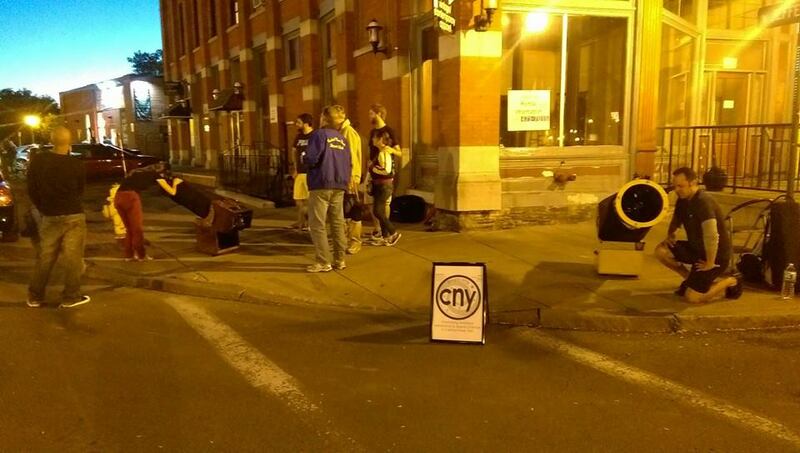 Besides the great dark skies, the CSSP also provides CNY clubs a chance to hang out and do nothing for a few days. I set up shop with fellow Kopernik members at the usual Kopernik location (the first left after the “Nova” signpost). 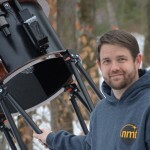 My vehicle was extra full this year with a special delivery of New Moon Telescope Dob #17 to Pedro Gomes, known previously on the CNYO Facebook Page as the hardest working observer in Watertown (now at points south). A panorama from the Kopernik site. Click for a larger view. For those roughing it on the site for the entire party, a not-untypical Saturday schedule might involve (1) staying up as late as the caffeine will allow, listening to angered attendees when someone accidentally turns on their car lights (which is less funny when you’ve waited a half-hour for your eyes to fully adjust to the dark, moonless sky), (2) sleeping in until the Sun cooks you in your tent or vehicle, (3) listen to someone (Pedro) tell you about the black bear that passed by his scope and tent the night before (the presence of a few black bears also explained the gunshot fired by camp rangers the night before), (4) going to the vendor tent, (5) making a trip to catering (well, trucks and tent) to wait in line to eat, (6) going back to the vendor tent, (7) attending one or more of the scheduled lectures and checking out the raffle donations (to pass the time until nightfall), (8) vendor tent, (9) raffle!, (10) caffeinate and apply bug spray (although it wasn’t too bad this year), and (11) See 1. 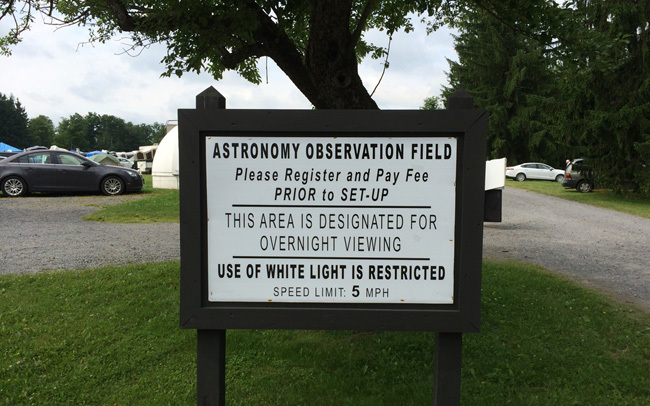 Observing Tip: If you want to make the most of a Star Party, consider taking a break from your usual caffeine intake a few weeks in advance. That first cup of coffee will feel like rocket fuel. I’m pleased to report that the raffle was a complete success for your’s truly. Not only did I score free admission to the upcoming Kopernik AstroFest in October, but I also managed to walk away with the 8 mm Delos graciously donated to CSSP directly by TeleVue Optics. The company rep, John, and I even had a good exchange Sunday morning (he having done some imaging of the Veil Nebula that night, I having passed around my trusty OIII-filtered 26 mm Nagler to others wanting to observe the same in the Kopernik camp). Admittedly, my bias towards TeleVue eyepieces is strong (and in the official record at Astronomy Technology Today), so the Delos was a very welcome addition (one should not observe Saturn without it!). And it will be present at CNYO events for those wanting to compare and contrast. Many thanks to TeleVue, Kopernik, and all of the CSSP donors (amateur astronomers take their raffle prizes very seriously)! 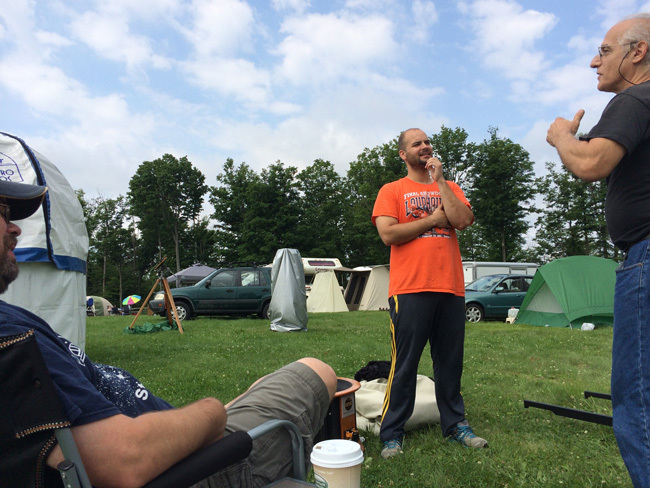 Patrick Manley (left) and Pedro Gomes listen as collimation guru Howie Glatter (right) talks shop. Click for a larger view. I was told that Thursday night was great but very wet. Friday night (my first night there) was a patchwork of clouds and less-than-thrilling seeing conditions. 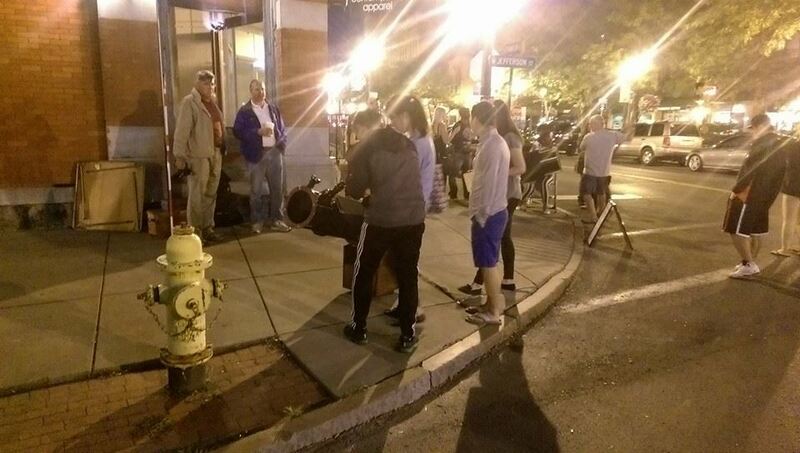 Saturday night was out-and-out fantastic. Going from about 9:30 p.m. to 2:30 a.m., my list included Saturn and Mars, 35 Messiers, 20 NGCs (including my personal favorite, NGC 4565), and a lot of just staring into “nowhere particular” just to enjoy the visual peace and quiet. 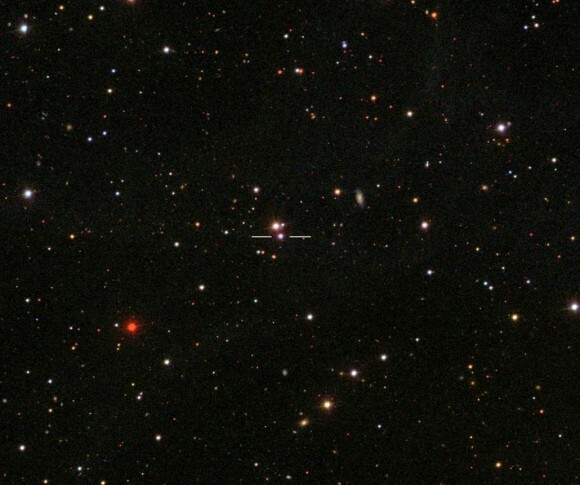 The one object I did want to take a stab at seeing was Blazar 3C 454.3 in Pegasus, having seen the announcement cross the CNYO Twitter Feed in the form of a link to universetoday.com (image at right from the Sloan Digital Sky Survey). Blazars are so bright that astronomers didn’t know until the 1970’s that they weren’t actual stars in our own Milky Way. Blazars are the cores of galaxies where matter is being sucked into a supermassive black hole, releasing in the process jets of energy perpendicular to the plane of the galaxy and right in our direction (so these host galaxies would appear to us like the Whirlpool Galaxy, where we’re seeing the whole galaxy face-on as we stare down its rotation axis). The blazar in Pegasus recently peaked at around 13th magnitude and has been dimming since. That’s dim. That’s far dimmer than binoculars and small scopes will reveal, but is just fine for a 12” Dobsonian (where 15th magnitude is possible under ideal conditions – which Cherry Springs almost certainly is). 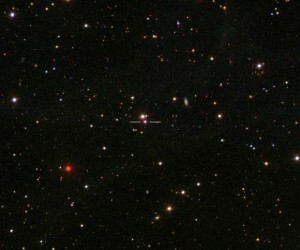 While not particularly impressive in any kind of scope, this blazar is noteworthy for being 7 billion light years away. When the photons beaming through that new 8 mm Delos left their home galaxy, the Sun and Earth were still more than 2 billion YEARS away from being ANYTHING. That, to my mind, compensates for the dim. 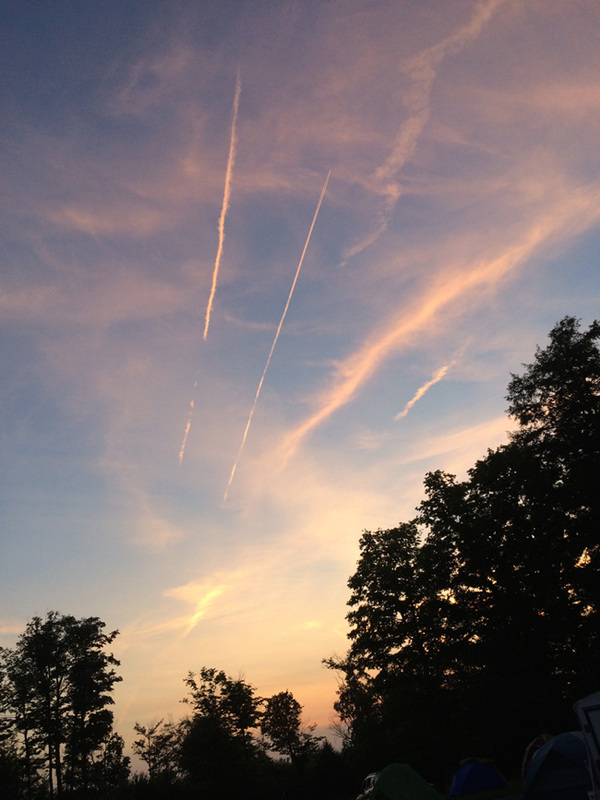 The view to the East at Sunset on Saturday night. Click for a larger view. By 2:45 a.m., the Kopernik crowd had thinned to just Keith Werkman and I. I packed up the scope and pulled out the camera for a few long-exposure shots just in time to see a few randomly-oriented bright meteors (not affiliated with the Boötids Meteor Shower, which peaked the night before) and a Milky Way band bright enough to read by. Another view of the Kopernik site at the CSSP. Click for a larger view. Groggy and sore from our respective sleeping arrangements, the gang began to split just after breakfast and a final clean-up of the grounds. 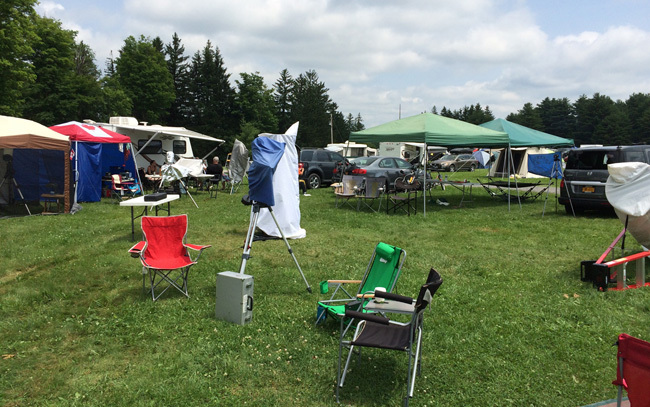 Having now survived my second CSSP with quite a bit of excellent viewing (and viewing tools) to show for it, I and others await next year’s CSSP and next month’s Black Forest Star Party at the same location.